Meaning and fascination – 2 good concepts to latch unto. Speaking of fascination. What’s happening with the radio show? Are you putting it on hold for a while? Will it start-up again? I miss the podcasts. I always like headline writing concepts being covered. Good stuff today. New radio show tomorrow. We only took last Friday off because we had two posts to run that day. Meaning and Fascination are just words. Meaning is a function of the author’s skill (requires practice to improve at it), while fascination is ultimately a function of the reader’s interest (which depends mostly on the context). Both of which are things you can’t much control directly within the limited timespan of actually sitting down to write a single article. 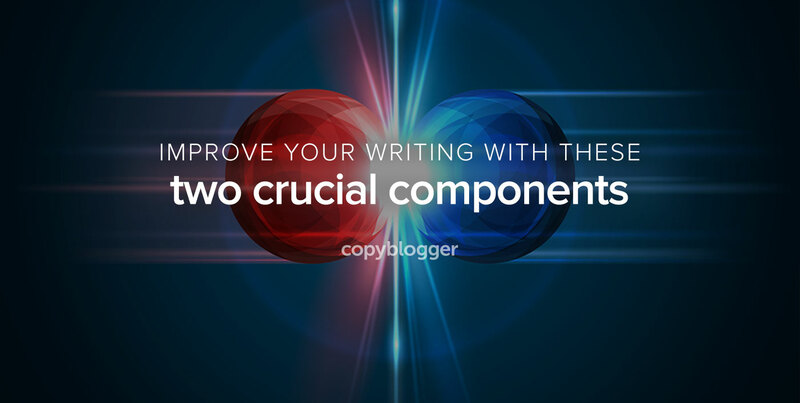 The one element we can and should focus on for strong and quick results is the writing *angle*. IMO the present article is really not so good (compared to the usual copyblogger quality level) because there’s not a clear angle to it. Doesn’t feel like you put much thought into this piece, sorry…. and this is coming from a regular fan, mind you. Pedro, when I talk about fascination, that’s the same as an angle. It’s just a more specific way to define an otherwise vague term. Sorry you didn’t like the article. Don’t be sorry someone didn’t like this article. Look around you, is there anything but praise being tossed around? I actually assumed you might find a bit of criticism refreshing, for a change! “How do you get this webinar? I almost bought ‘The Premise’ last night. I’m glad I waited 24 hours. After posting this comment I will buy it. I’m glad you are back with a bang! “The point is to bond strongly with someone rather than boring everyone.” Excellent point! It’s almost never worth it to be all things to all people, it just makes your writing come across as bland. Really dig in and find a specific audience you want to connect with and write for them! How about running a survey on what product to launch next, and give the headilnes webinar for free to three people who take the survey? Brian, I bought ‘The Premise’ as I said in my previous comment. I was going to buy it regardless of the gifts, but are the added ingredients that pushed me over. I’m glad I bought it because I need it and love it as well. Cool Ebuka, I think you’ll love the software. And we’ve got tons more valuable seminars coming for Premise owners only. If I did that, it was unintentional. Which album? Which album!? #unfollow. 😉 Essential Elements. I agree with Susanna Perkins. I bought Premise, and the webinar with you and Jeff was worth the purchase price. I know! You should sell the webinar and give away Premise as a free-prize-inside! Excellent post Brian. It solidifies something that I have been noticing about good headlines and good post topics for a while now. I have been trying to put my finger on exactly what it is and this post explained it nicely so that I will be able to apply it more effectively. I recently wrote a post called ‘The “Chutes And Ladders” Guide To The Simple Sales Success Formula’ based on my limited understanding of this concept. I think you’ve got it Russ. Sometimes it helps to have concrete clarification of the things we’ve already started picking up on. I know I do. The webinar with you and Jeff Sexton was excellent! It really helped me to get over the mental block I have with writing headlines. Your formula of “meaning + fascination = the secret to engaging content and great headlines” is right on. My problem is the “fascination”. I am hoping that as I use Premise this challenge will disappear. Practice. Practice. Practice. Question: In using Scribe to review my post, if the keyword is not toward the front it dings you. So how do you balance that with creating Magnetic Headlines? “How I Became a Better Writer Thanks to Distracted, Hungover College Kids” would get a good score from Scribe, because the keyword “Better Writer” is near the front. My guess is that “5 Things Depeche Mode Can Teach You About Effective Online Marketing” would not get a good “Title” score because the keyword “Effective Online Marketing” is at the end of the long title. I know I’m dissecting this to bits, however I’m really trying to wrap my head around this. So, I’m thinking that one way to fix this might be to change the Meta Title or maybe the Title I input into All In One SEO (the plugin I use with Scribe)? Theresa, that’s right. You put your “magnetic” headline on the page people see, and your more search-focused headline in the alternate title tag space with SEO All in One or WordPress theme frameworks like Genesis. Even your alternate tag should be compelling, since it’s people who use search engines. But leading with the keywords is farily important in search results, both for the search algorithms and for people who want to be assured that your content is relevant to what they’re looking for. Thank you for clarifying. I need to work on this strategy and think more creatively on ways to achieve great headlines and search results. Can’t wait to build my next Premise landing page! Oddly enough, one of the suggested headlines in Premise was “The Richard Simmons Guide to Short-Short Stories”. Seriously though, I’m enjoying the product. I was just kidding about the headline (I made that one up). Glad to know Sonia and I might share a similar sense of humor! I wasn’t kidding about my fondness for Premise. Great post! Great choice of words, as well. Something that every writer needs to think about when writing. It’s all about the viewers. You made my day Brian. You crashed my server, at it rocked. I mean no offense at this comment — but there are literally thousands of people on the web providing recommendations, advice, education, tips, tricks and techniques about how to write copy that sells, persuades, compels, fascinates, mesmerizes, hooks, convinces and/or brings money pouring in through the mail slot or Paypal. My question is this: how do we know who’s giving us the right advice and who’s just putting anything out there to get attention (read: income)? Another “classic” that’s destined to become a “page”. “You’re The Man!” seems to not quite cover it. Why is it, Brian, that you write the best damn posts on the planet? Man, it’s about time you brought your aweseomeness to Facebook! 🙂 I’ve been off of it for coming up on 90 days now but I’m Saturday I’m back and I’ll for damn sure be clicking “Like”. Love the way you broke this down so explicitly, yet simply. Writing headlines for SEO while simultaneously grabbing attention has been something I’ve fought and your wisdom on this topic has made it easier for me to put down my gloves and embrace this idea because it gives me the best of both worlds. Thank you and congratulations on taking the next step to dominating yet another media! Content writing can certainly be a challenge at times but this post is a definite push in the right direction. Thanks! It really is the biggest challenge. I often wonder if it’s better writing less than more (of course it is). The problem is in my head everything sounds like a brilliant post but in hindsight it probably had limited interest. I’ve no idea how you guys do it here….you write about content all the time and it sounds like the most boring topic on the planet, certainly to write about every day, yet it comes out interesting all the time! I totally agree with the previous comment that something sounds good in my head, but when I actually sit down to write the post, even I’m bored with it! It’s usually late at night when I get a lot of great ideas, and I think about all of the things I want to say, but when I get to my computer in the morning, it doesn’t come out the way I pictured it, and I end up trying to think of something else to write about. It’s frustrating because I read so many blogs that have multiple posts every day, and they’re all interesting. Where do they find the time to write all of these articles? I have trouble keeping up with a few posts per week! Great analogy you’ve got here. I totally agree with you. The mixture of meaning and fascination can really help provide a very engaging content for readers. Thanks for the share. Keep it up. This post is one of the best I have ever read on the internet. And I’ve never said that before. Seriously. Maybe it’s because my brain just had a big connect on something I’ve been trying to articulate. Maybe it’s because I am presenting at upcoming academic conferences about how to effectively use pop culture to connect with students. Whatever the reason, I will be holding onto this one for a while! Great job Brian. Nice Write-up. I don’t know how I missed it. Headlines are the most important thing when it comes to traffic apart from content. I discovered yourself and Copy Blogger a year and a half ago. I wanted to write some super geeky and tragically boring photography ebooks. But your advice on headlines and writing changed everything for me. It started me on a new learning journey. The fascination aspect has always alluded me though until recently. On a whim, I decided to explain a photography concept in a bizarre way. People read it, liked it, and shared it. This fascination stuff really works! Without your help, I would be boring my reader to death. Great message! Regrettably, meaning + stodgy better describes my realm 🙂 Fascinating is the missing element that needs work. Thanks. Brian, you keep impressing me. Your content is just so damn good, man! What are some questions you’d ask yourself about a piece before, during, and after you write it to ensure it provides massive value for your targeted audience? If it isn’t original and interesting, nobody’s going to read it. Cool Post Brian! Thousands of bloggers are there to present their content but make sure you should talk in a way, so people want to listen. Always try to significant in your conversation. Thanks for this though-provoking article. I always though about writing compelling content but have never articulated what’s the best way to engage your audience in a more personal level. And sure enough what you mentioned about meaning and fascination really adds spice to the post. I totally agree with you. It can really help provide a very engaging content for readers. Great point Brian! Meaning and fascination is a BIG part to attract your prospect, build a relationship, and make the sale. It’s great to always include in making headlines. Of course, commitment can’t happen in nine seconds, but introductions can.